Finding a new place to call home can be a challenging task. There’s so much for you to factor in when making your decision, including your budget, the location, local amenities, and on-site amenities. But it’s when you find a place that really goes above and beyond to offer exceptional amenities that your decision is made that much easier. And that’s exactly the case with The National. When you make the decision to call this place home, you’ll find yourself as the resident of an Old City apartment with a rooftop deck. That’s right: Head to the rooftop of this stylish apartment building, and you’re treated to a chic lounge area that’s perfect for relaxing after a long day at the office, or for hosting an intimate gathering of friends and family. Mind you, on the roof is more than just a couple of chairs. There’s also a bar area that you can take advantage of and serve your guests in style. Plus, you’ll find two grills available for use so you can cook up a good meal. Then, sit down to enjoy your feast in the outdoor dining area, all while taking in the views of the city from your vantage point right in the heart of Philadelphia. When the evenings begin to get a bit chilly, skip the sweater and instead park yourself in front of the crackling fire pit while sipping on a steaming mug of hot chocolate or tea. You won’t find a more picturesque apartment experience anywhere else in the City of Brotherly Love. Not to be forgotten, if you’re up for a little friendly competition, be sure to challenge your friends to a foosball game. (Yes, there’s a table for that up there, too.) They’re sure to be impressed when you show off your pull kick shot skills that you’re sure to work on perfecting the moment you move in. What do you have to lose? 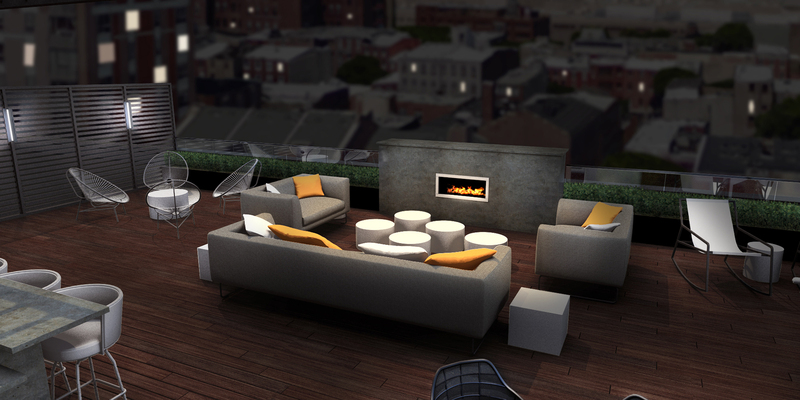 Make an appointment today to see one of our available Old City apartments with a rooftop deck. Your new home could be the site of the most happening bar in Philadelphia but without the heavy crowds and costly cocktail prices. We just know you’ll jump on the chance to call this place home.